Something or the other is always expected of us. By 'us' I refer to the entire human race. I was wondering, just when do people start expecting things from each other? I realised, it was from birth. Then I thought some more and realised, it is before we are even born. Let me elaborate.. When you are in your mother's womb, they expect you to pop out of your mother after 9months, if you dont come early that is. So, that is the first expectation. You have to be born. Then after taking birth, you are supposed to start crying with the first breath. I am neither a doctor nor a mother, nor do I remember what I did immediately after I was born, so I don't know what more is expected. So the second expectation is to cry. And so on. Then you are expected to laugh and cry appropriately, get excited in appropriate situations. Then you are supposed to start speaking. Say mumma, daddy, banana, Czechoslovakia and so on. Then or at the same time, you are supposed to show movement, crawl, sit, walk and so on. Then comes the toddler stage. You are supposed to remember the names of the things pointed out to you by your parents\ relatives \ siblings. You are supposed to clear the admission interview in the school you are expected to get into. Most of the times you are expected to clear the interviews of ALL the schools in which your parents have applied. Then in school ,you are supposed to make friends, pass exams, be disciplined. This is of course expected of you for each and every exam, each and every course you undertake. You are expected to take part in some sport or any other extra curricular activity which generally is given less importance than academics even if you excel in that activity. You are expected to get a degree. Get a job. A certain age is quoted to you and you are told that that is your marriagable age. So by that age you are supposed to get married. You are supposed to provide your folks with grandchildren after a period of time. You are supposed to support your parents in their old-age, you are supposed to retire eventually, raise you children properly, and in this cycle you start expecting things too. And this goes on. Of course there are other random expectations like, you are expected to recover from any ailments or injuries you might have had. If you know how to cook, you are expected to cook etcetera. Not to mention expectations from sportspersons, actors, politicians, and all those who perform well in their fields.Where is the free will? Gone with the Goddamn wind? Oh and the worst(?) part, the things that you expect from yourself. I wrote all this because I was overwhelmed with all the expectations, I wondered what happens if you defy all the expectations. I wondered when and if they would end. I concluded that they never end. I also concluded that you may be expected to do many things but you are also not expected to fulfill all those expectations. I am not saying expectations are a bad thing, no. I am just acknowledging the fact that they are everywhere and the fact that you can chose to ignore or fulfill those expectations. I suppose therein lies our free will. To fulfill or to ignore the expectations. That is what free will is all about. To ignore or no to ignore. hey..nice post..going through other posts now...i never thought about these expectations...but we somehow manage to fulfill them...there are those we expect from ourselves too. WOAH baby! Yeah life is all about checklist... Done this and then on to the next.. But there are some random spaces for being spontaneous. we are spontaneous all the time, wont people EXPECT us to be spontaneous? 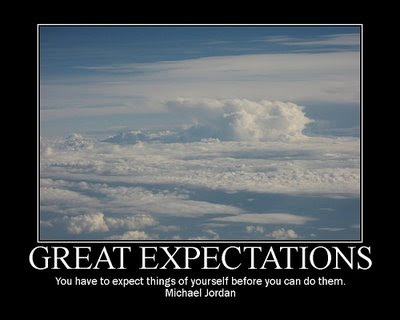 what happens when you defy those expectations? you feel truly alive. once you start, there's no turning back. believe me. I have a few expectations from you. Its high time you start working on them. Depends the way we accept. Liked the way, you kept it flowing. I am with Roy on this one. Come on Ruch, work with me on this. btw, the image i posted which quotes His Airiness.. aint it contradicting ? I think you have replaced things like desire, want etc. with expectations in some cases. Remember that you too have some desires right. They are not expectations. If you desire to be something, do you not EXPECT to get it? what if you defy that expectation? You will end up not fulfilling you desire. Also many times you just want things, without expecting it. Say I want Force India to win F1, my expectations are far from that. So, its good to note the difference between the both. Also know that expectations put burden on the person having them more often than vice versa. Anyway, cheers. Rest all is fine, Nice post, saw a different POV. the expectations that we have from ourselves can be takn as goals. when others expect too much w\o considering ur prefernce for it, then it is a burden. what others expect from us is not our desire or our goal, its just that an expectation. but what we expect from ourselves, yo that is a goal, a desire as you put it. Exactly my point. You got it right now.